I just want to let you know that the Planet Waves blog has moved to a fantastic new location. Since this is a fresh start for us, we are asking everyone to re-rgister to get access and to comment. This is actually an Introductory Membership to Planet Waves, which requires no credit card. 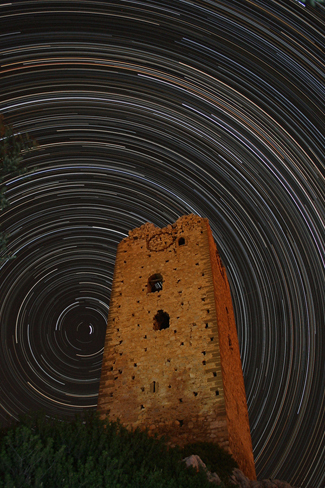 Star trails over one of the Twin Towers at Mytika (1429 AD) in central Euvoia, Greece. Photo by Anthony Ayiomamitis for Planet Waves. Registering is easy and takes about two minutes. Then you will have access to your Inner Space monthly horoscope, as well as writing by Judith Gayle (Political Waves), Len Wallick (astrology columnist), Sarah Taylor (tarot reader and teacher). Take a look at the new site -- it's truly beautiful, organizing all of our writing and all of my astrology readings in one location. This weekend we have two upgrade offers, the price of which goes up Monday. Sooner or later you will sign up -- you may as well get the best price. Core Community level gets you all of our writing, two different weekly horoscopes, three monthly horoscopes, full archive access and use of The Oracle divination tool. This is a truly beautiful invention that you can try out this weekend, even as an Introductory Member. It's located along the right sidebar of the new site. Core Community is $199 a year, though this weekend we are offering it for the introductory price of $99. You can sign up monthly for $12.99. The price goes up Monday. If you sign up now, you will be offered a discount subscription in one year. All Access level gets you everything you get for Core Community, plus all of my recorded readings -- birthday readings, annual readings and seasonal projects like the spring reading and midyear report. The cost of this is $89 quarterly. For more details about the All Access Pass, please check this letter. Both levels offer delivery of Daily Astrology, my daily SMS service and many other fantastic feature that put the power of astrology in your hands. We are looking forward to seeing you over at our new website, years in the making, all created to serve you better. PS, Introductory Membership is at no charge to you, and no credit card is required. It's a quick sign-up that gets you access to many exciting, useful features. You'll get to see everything else we offer, and you will be the first to hear about what we are doing at Planet Waves.